What is VideoTag? | What is Tagging? | Why Participate? 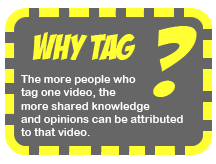 VideoTag is a social tagging experiment, we're hoping to educate people on the potential benefits of video tagging whilst analysing the tags to see how useful they could be at describing the video content and gauging opinion about the videos. We're interested in how the tags are related to the video and the vocabulary people use. Our aim is to provide a useful resource for people who love watching online video, people who love creating online video and for people to learn or be entertained through the discovery of videos a standard keyword search might have missed. What is tagging? Tags are words, keywords to be exact, words that describe the object being tagged. 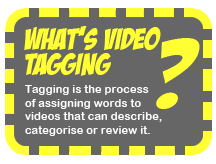 Video tagging is the process of assigning keywords to videos. Share knowledge, share opinions, describe what you see, describe what you hear, or describe how you feel. Through tagging the videos as you watch them you are helping to create rich keywords that can be used to index the videos and make them easier for you, your friends and people with similar interests to find. The more text that exists for a video the easier it is to see at a glance if it fits your search need. The more people who tag the same video, the more varied those keywords are. The more people who enter the same keyword, the more we all know that word accurately describes the video. 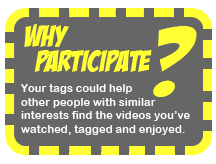 VideoTag has made these tags or descriptions available for you and other users to interact with, you could find videos of interest you might never ordinarily have watched. Millions of people play millions of online games every day and invest hours upon hours of time into games that have little or no purpose other than to entertain. What if you could be entertained and participate in a useful task? VideoTag lets you do just that. Play some quick fun games whilst tagging videos. Choose a video that interests you then select which game you want to play, each game has a different challenge. You score points depending on the type of tags you enter and depending on the game. All players start out as an intern, as you earn points you'll get promoted until you eventually reach the role of commissioner. Once you are a researcher you can upload your own videos to VideoTag. 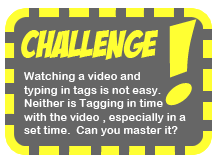 For those that prefer the idea of watching the whole video and just tagging it, without being entertained by a game we have Simply Tag - simply watch and tag, for as long as you want. 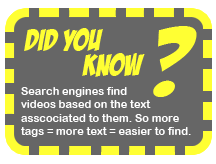 Search engines know what a video is about by the text associated with that video e.g. it's title or description. This text is provided by the person who uploaded the video. It may not be entirely accurate or not detailed enough to fully describe the video. Tagging is a useful way of gathering text that describes the content of the video, if done collectively, by many viewers of the video you could potentially get a rich variety of descriptive words that could be used by search engines or curators to organise online video collections and improve their findability. If no system exists to allow this collective tagging, there is no way of finding out just how useful the tags can be. At present viewers of You Tube videos cannot tag the videos they are watching, be that to label videos as they add them to their own collections or to label them for the You Tube community. You Tube used to include tags entered by the videos owner in the video description, but they appear to have dropped that feature. The VideoTag experiment aims to encourage the collective tagging of online videos. It is hoped the game based tagging environment will encourage users to tag and also stimulate a rich and varied vocabulary of tags. The tags generated will facilitate research into the potential benefits of a collaborative tagging system for online videos collections. Phase 1 of the VideoTag experiment can still be played here.